The Kennel Club governs every aspect of dog showing and competition in the United Kingdom. Every show run in the UK has to be licensed by the Kennel Club. The organising club must apply for the show up to three years before the date is requested; a diary is kept in the show division where it is aimed for shows not to clash with similar events locally or within a breed. All general championship dog shows are scheduled not to overlap, regardless of where they are in the UK, as most exhibitors will travel many miles to compete. All clubs and general canine societies, whether they are for an individual breed sport such as obedience, agility or ringcraft have to be registered with the Kennel Club. They pay a yearly registration fee and agree to abide by rules set by the Kennel Club. Any person invited to judge at a Championship show must be on the Kennel Club judges list. This means they have trained and passed all requirements needed for a show judge. If the person is a ‘first time judge’ the Kennel club will ensure that they have passed all the requirements and that they have been voted on by the relevant breed council or breed clubs. This voting has to be done by people on breed club committees that have the knowledge and expertise to decide if a person is suitable to judge their breed. These rules came into force after many years of breed clubs passing friends and acquaintances. Quite often the term ‘backhanders’ was used whereby certain clubs would pass committee members of other clubs to judge and vice versa. This is against the ethics of the Kennel Club and has mainly been stamped out, however, it can still go on in certain breed clubs and is up to officers, committee members and general members to take note and be aware of these people. The show manager of a show committee of any club, must ensure that the show is run correctly. If an exhibitor is unhappy about any aspect or incident at the show they are invited to lodge a complaint with the secretary who will pass it on to the Kennel Club. The person lodging the complaint must pay a fee of £35.00 when making their complaint. They must also be prepared to make a statement and act as a witness if the complaint goes before a Kennel Club sub committee. All dogs entered in dog shows must be registered with the Kennel Club. If the ownership of the dog is still being changed this must be shown on the entry form. Exhibitors have to sign the entry form and agree to abide by the rules and regulations of the show – these are listed within the show schedule – the Kennel club frowns upon any person not following these rules or entering the wrong classes. If this should happen any wins are taken from the exhibitor and a fine is imposed. 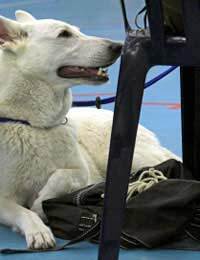 Many other kennel clubs around the globe use our Kennel Club as a blueprint when organising their own shows and events. If the organising clubs and societies follow the rules and regulations given to them, then normally a show will run without cause for complaint.